NORTH SHORE MUSTANGS STATE CHAMPIONS in OT! North Shore Senior High School, home of the Mustangs, began their season with a measure of adversity. Under second year head coach Jon Kay, the Mustangs won their first game of the season, then lost their next three in a row. Admittedly the losses were to teams who were highly ranked in the state, making North Shore the underdogs, but the Mustangs coaching staff and players expected to win them all. However, at 1-3, the Mustangs regrouped, put the past behind them, and began a long, slow ascent to the pinnacle of high school sports. They did not lose again. As they remained undefeated, a feat many thought unlikely as they battled more highly ranked foes in the playoffs, the challenges became greater. Dickinson was supposed to knock them out. They didn’t. Converse Judson, a team who sent them home in previous semi-final matches, was highly favored to win. They did not. 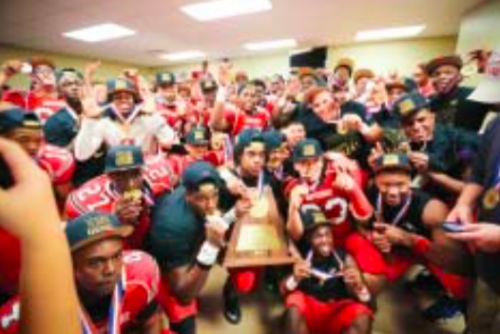 And finally, in the state championship game against Austin Westlake, the Mustangs again found themselves underdogs. But the Mustangs never looked or played like underdogs. Jacinto City, TX December 28, 2015: In an effort to make New Year’s Eve safe in Jacinto City the city has ordered a zero tolerance enforcement of laws banning celebratory gunfire and fireworks. Every patrol vehicle and unmarked car owned by the city will be patrolling our streets and writing citations to all violators. Our goal is to warn residents about the dangers of both gunfire and fireworks during holiday celebrations. Last year a resident in Southeast Houston was struck and killed by a bullet fired during a New Year’s Eve celebration. One moment he was on his porch watching fireworks then the next he was on the ground bleeding profusely from a bullet wound to the head. Many people don’t realize that each bullet fired will come down with a velocity capable of causing extensive injuries or death. The goal is not to dampen anybody’s celebration just to avoid a senseless tragedy that can easily be prevented. Fireworks are included in the enforcement effort due to the potential for injuries or fires. Over the last year in the United States there was over 10,500 fireworks related injuries requiring medical treatment. The largest culprit was the simple sparkler which is the leading cause for hand injuries since it remains extremely hot long after it “goes out”. Residents needing to report gunfire or the use of fireworks can call 911 without giving their name or having to speak to an officer. With over a dozen units patrolling the city, our police should have a quick response time and be able to make a significant impact on this longstanding problem. We are asking neighbors to spread the word about this effort. Warnings will also be posted on all city signs. The goal of the program is not to write citations. We would prefer to have voluntary compliance rather than citations. 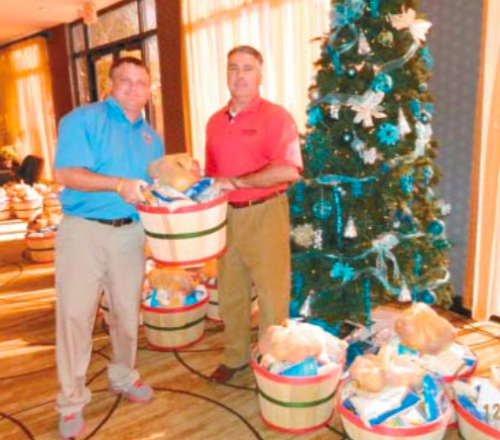 NORTH SHORE ROTARY distributed 250 full Christmas Baskets of donated food, to needy families in the immediate North Shore areas. Pictured above are Rotarians John Parrott and club president Mike Williams, preparing to load one of the full baskets into cars waiting to make the distribution. The club has conducted this Holiday tradition for a number of years, with all the members of the club participating, by collecting and sorting the foods, packing the baskets, driving out to the community to distribute the food baskets. THE NORTH SHORE Community held their annual Christmas Parade last Friday night, Dec. 18, with the participation of the Sheldon and Cloverleaf Fire Departments. Rodney Redford of the North Channel Assistance Ministries helped organize the parade. It started in Channelview, and ended at the Kroger Parking lot at Woodforest and Normandy. Hundreds of families followed the parade, and then collected in the Kroger parking lot while Santa and Rudolph handed out small gifts. Redford reported that the parade judges made the following awards: Best Apparatus, Sheldon FD; Best Float, Cloverleaf Church of God; Best Theme, Growing In Grace; and Judges’ Choice, Boy Scout Troop 1301. Eric Monroe (#11) leads the charge in the second half, carrying the banner for the Mustangs. Monroe rushed for a 32-yard touchdown and had a key interception. He was also named the Houston Chronicle High School Athlete of the Week for December 15. 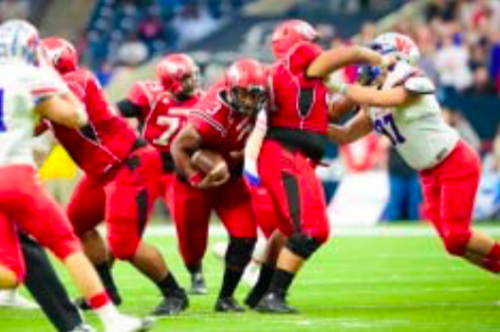 The North Shore Mustangs, against many odds, have journeyed a tough road to earn the right to play in the state championship game, most recently defeating Converse Judson 23-17 at NRG Stadium Saturday evening. 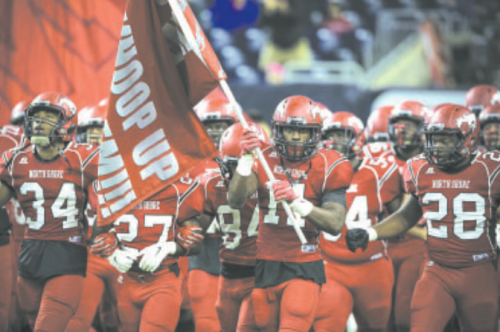 Judson, a perennially tough opponent, has advanced to the state semifinals 18 times a state record. But on this day, the Mustangs doused the Rockets fuse with a mighty defensive effort and the strength of their special teams. The first score, and the only score of the first quarter, was a 23-yard field goal by North Shore’s kicker Aaron Cuevas. The defense shut down the Converse offense, aided by a punishing defensive line and a perfectly timed interception by Eric Monroe. In the second quarter the Mustang offense got things rolling, capping a drive with a 32-yard touchdown run by Eric Monroe, giving the Mustangs a 10-0 lead. But four minutes later the Rockets scored on a 58-yard pass. As tension mounted, Aaron Cuevas again answered the call, kicking a 46-yard field goal to give the Mustangs a little breathing room and a 13-7 lead at the half. But the cushion was not enough as the Rockets scored first in the second half and took the lead 13-14. 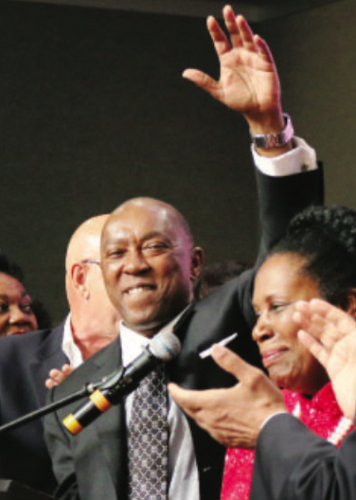 In a close race, Sylvester Turner defeated Bill King last Saturday to become the first Houston mayor to serve a four year rather than a two year term. He will need to solve issues of pensions, potholes, and policing during his time in office. Jubilant but concilitory in his acceptance speech, Turner said “Let’s everyone put the Election behind us and go to work for a better Houston.” A final count put 108,389 votes for Turner, 104,307 for King. Sylvester Turner is a native of Acres Homes in the Northeast, but promises to represent everyone in the city equally. Other winners included Chris Brown for Controller, and Rhonda Skillern-Jones for school board. 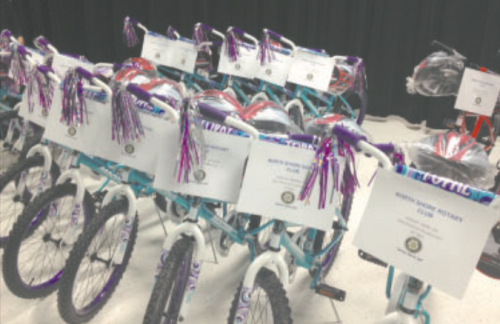 Wednesday, December 9, 2015, the San Jacinto Pilot Club joined the North Shore Rotary Club to donate 130 bicycles (from Rotary) and helmets (from Pilot), assembled by LyondellBasell, to elementary school students who had perfect attendance in the after school program sponsored by Harris County Precinct2Gether. Many thanks to Texas Medical Association’s Hard Hats for Little Heads for partnering with us to help fund the helmets. It was a beautiful day for football in Pasadena — clear skies and 60 degrees. The North Shore Mustangs took on Dickinson in the fourth round of playoffs on Saturday, December 5. The Mustangs took an early lead on an exciting 96-yard punt return for a touchdown. Dickinson followed up with a touchdown scoring drive to even the score at seven. An interception by Josh Sifuentes sparked a surge late in the first half. The Mustangs tacked on 10 more points an Aaron Cuevas 22-yard field goal and a 13-yard touchdown pass from Bryant Badie to Eltroy Potts, giving them a 17-7 lead at half time. The Mustangs struck first in the second half with a one-yard touchdown run by Guillory. Dickenson struck back on their ensuing drive with a touchdown of their own; however, it would be the last time they scored. The final three scores of the game came from the Mustangs offense, defense and special teams, starting with a 54-yard punt return by Jacory Nichols, his second of the day. Next the offense scored on a 2-yard run by Guillory. Next, the defense scored on a 45-yard interception return. Next up: The Mustangs will take on Converse Judson out of San Antonio Saturday, December 12 in NRG Stadium at 5:30 PM. HO! HO! HO! 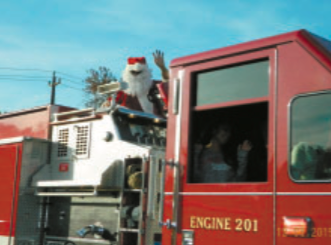 Santa was happy to arrive in Jacinto City in a fire truck, instead of his usual sleight, since there was no snow, just a beautiful sunshiny day. 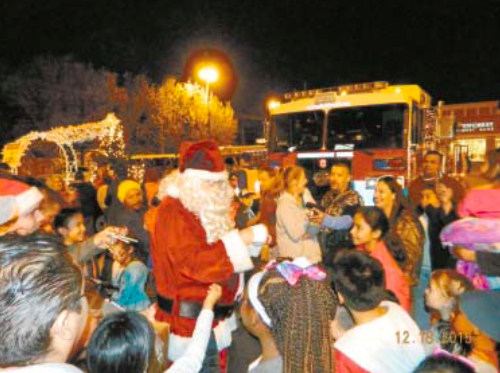 Hundreds of Jacinto City residents lined the streets for the Annual Christmas Parade. It started on Wiggins Street near the elementary school, proceeded down Market Street, and ended at the Town Center on Oates. Mayor Ana Diaz led the city delegation of councilpersons, with other dignitaries present also, including Constable Chris Diaz, and Congresspersons Gene Green and Sheila Jackson Lee. After the offensive line opening up holes, Bryant Badie (#9) squirts up the middle for a long gain. Badie had 58 yards rushing on the day to go along with 63 yards passing, including an 11-yard TD pass. 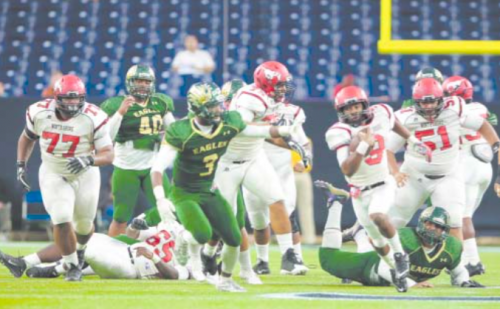 The North Shore Mustangs visited NRG Stadium on Black Friday to take on the Cy-Falls Eagles in their third playoff game of the season, winning by a final score of 28-21. The Mustangs fell behind early, allowing the Eagles to score first; however, the Mustangs quickly tied the score on their next possession with an 11-yard run from Tyler Boudreaux. Shortly afterward, A 91-yard touchdown run by the Eagles along with an interception returned for a touchdown caused a bit of concern for some, but the Mustangs never lost focus. Carl Guillory’s first touchdown of the day, a 55-yard run, brought the Mustangs within seven at half time. 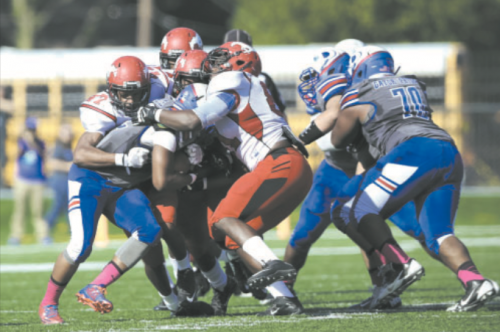 The size, power and depth of the Mustang defense was evident in the second half as they kept the Eagles from scoring while North Shore tacked on two more touchdowns, a 9-yard pass from Bryant Badie to Eric Monroe in the third quarter and a 14-yard run from Guillory. Next up the Mustangs face Dickinson in the regional finals on Saturday, December 5 at 1:00 PM at Pasadena Veterans Memorial Stadium. 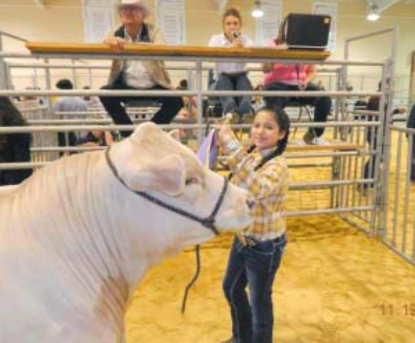 AMARIS MOYA shows her Grand Champion Steer at the Galena Park FFA Livestock Show and Auction. The steer was purchased by the North Shore Rotary Club, for $8500. Auctioneer Heather Kaspar hold the mike. Galena Park ISD held their annual FFA Livestock Show and Auction on November 16-19, at the Ag Facility on Holland Avenue. Forty-Five lots were sold, and the unofficial total raised for student scholarships and the program was over $65,000, plus so-called “add-ons” after the official bidding. The Grand Champion Steer was raised by Amaris Moya, and sold for $8500 to the North Shore Rotary Club. Last year’s GC steer had sold for more, $13,250. Prices this year were up on some categories, and down on others, but in general were lower. Additional monies come from corporate and business sponsors.